Deep Instinct successfully passed the SE Labs on-demand malware detection test on prevalent, recent malware. This certifies Deep Instinct as an AV replacement. As cyber-attacks become more and more sophisticated over time, prevention and detection have become more of a focus. 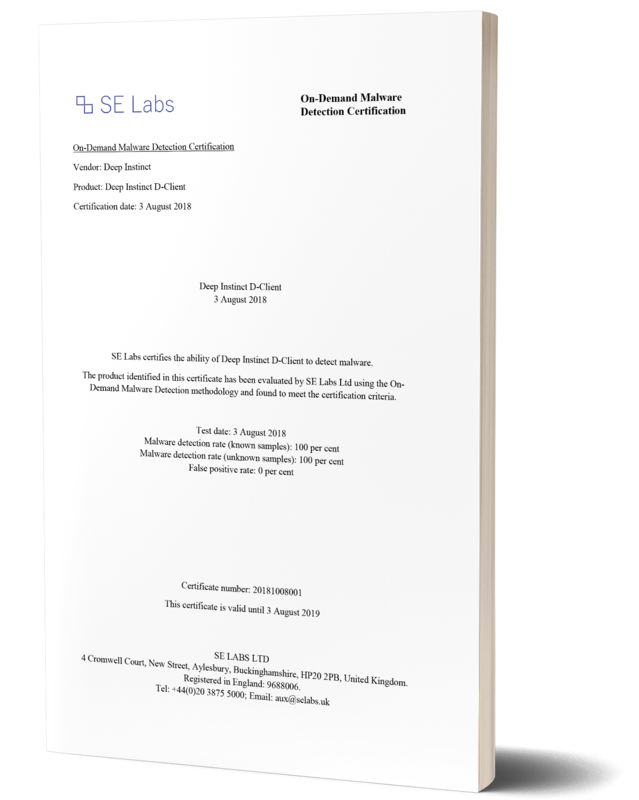 For this reason, SE Labs tests the ability of anti-malware products to detect malicious files with no errors. The dataset used for this test comes from the Anti-Malware Testing Standards Organization (AMTSO) and comprises the 250 most recent, prevalent threats and their mutations. Deep Instinct passed the test with 100% detection and 0 false positives. Providing qualitative proof for the product's effectiveness as a malware detection solution, and as an AV replacement solution.